Intermedic has pledged a substantial amount to support LAU’s continuing medication education program over the next four years. Intermedic’s gift will benefit all three health schools as well as local practitioners. Intermedic, one of the region’s largest distributors of medical supplies and equipment, has pledged to support LAU’s continuing medical education program over the next four years. 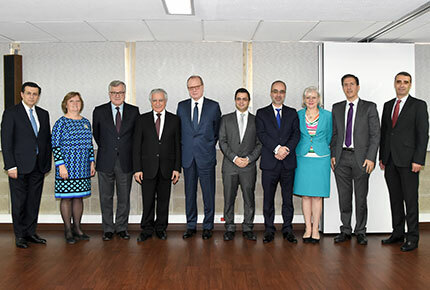 “This gift is very important because of our profound belief that medical education must be offered on a continuing basis, and because medical education is the bedrock of high-quality healthcare,” said Joseph G. Jabbra, president of LAU, at the signing ceremony held in December in Byblos. The company’s gift will be divided over a four-year period and will benefit the university’s healthcare-related schools including the Gilbert and Rose-Marie Chagoury School of Medicine, Alice Ramez Chagoury School of Nursing, and the School of Pharmacy, as well as local practitioners. The first activity to be supported by the gift is an interprofessional education (IPE) conference scheduled for April 2016. The conference will gather the country’s medical, nursing, and pharmaceutical professionals to focus on acute care with special emphasis on mobility impairment and pain management. Explaining the importance of continuing education, dean of LAU’s Nursing school, Nancy Hoffart said, “All health professionals must engage in lifelong learning to keep up-to-date with the advances in healthcare knowledge and its application to patient care. So Intermedic’s gift will positively impact practicing medical doctors, registered nurses, pharmacists, and dieticians, among others.” Hoffart, along with the schools of Medicine and Pharmacy deans, Youssef Comair and Imad Btaiche respectively, was involved in securing Intermedic’s support and determining the gift’s allocation. “We will be working jointly toward a common educational cause that aims to enhance the transfer of technology, technical support and educational matters,” stated Michel Farah, vice president of Intermedic, at the signing ceremony.